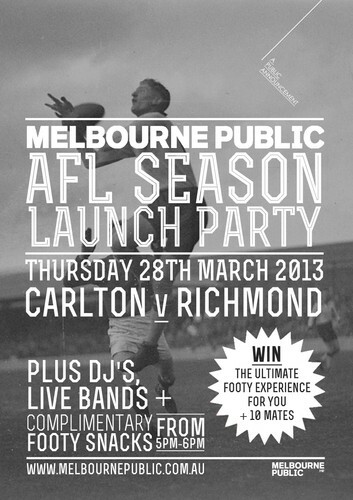 Melbourne Public Bar and Restaurant has your ticket to this seasons AFL. So start the Easter long weekend early and join us to kick off the season with live bands and DJ’s plus the Carlton v Collingwood game live across our screens. Complimentary footy snacks and the chance to win the ultimate MP footy experience for you and 10 mates! Melbourne Public is your footy venue for 2013 with 5 large TV’s screening every game live, seriously good pub food, discount parking at South Wharf DFO and only 900 meters across the bridge to Etihad stadium.